We have lined up the Quest Skateboards Review for you today in this article. Did we talk about this unit in our best longboards review article? Well, that doesn’t matter much anymore as this is a complete review itself. One of the coolest ways to work out and move around is to go longboarding. Did you know that through longboarding a person can burn around 150-500 calories per hour on average? Cool, right? Of course, the amount will depend on the magnitude of the skate. Longboard Skating is not only a form of art but it is a lifestyle that comes with several health benefits, such as, enhancement of body coordination, flexibility, physical stamina and much more. Users need to understand that Longboarding skateboards are quite different from normal skateboards. This is quite imperative. Hence, before advancing further let us look at the difference. Longboarding skateboards are shaped like surf boards only with wheels to balance bigger turns and comfortable cruise. They are much wider and more balanced than skateboards which are smaller in every dimension. Longboard skateboards come in several shapes and material. Among them the best are the ones that come as a fully assembled set and have a wide board made of maple wood, good wheels and long trucks. Keeping the key points in mind here is a product that we have reviewed for you that will serve you with the best only to make you longboarding experience more enjoyable and fun. Among the boards that are available in the market, this is one of the fascinating ones. Let us now take a closer look at the product. So before you change your mind and read our other longboard reviews, let’s dive into the details. At first, you need to look for the shape of your board. The board will be flat in shape and It is quite obvious that. However, longboards will usually look like surfboards, that is, it has an oval shape at the front that comes down to a narrow end at the back. The Super Cruiser Longboard Skateboard looks like a wide surfboard that gives the cruiser perfect balance and allows them to travel further and even downhill with greater control. It ensures better performance due to its kick tail and nose. This makes it equipped to handle abrupt bigger turns comfortably. The Super Cruiser has a 44 inch deck as the name suggests and as I have mentioned earlier. This means the board is bigger in every dimension and will give users the perfect equity over control. Longboards require soft and big wheels and Quest provides durable 70x51mm 80A PU wheels with their product. The trucks that hold the wheels are made of Aluminum. They are coarse and featherweight and are 7 inches in size. The bearings used are Precision ABEC 7 Bearings and has a Hollow 4mm Risers. The best materials used to make longboards are Canadian maple wood, Bamboo and Plywood and Quest Skateboard come in with the best. The deck is made of 7 ply super flex artisan bamboo and hardwood maple. This means it is very strong and well-built. The wheels are very smooth, long lasting and in compliance with the truck. The Wheel Wells present in the product prevents “Wheel Bites” when there are long turns. The trucks are longer in size and made of Aluminum which makes it strong but resistant to rusting. It is very crucial to consider the design when buying a skateboard. You do not want to buy a design that you want to scrape off later. The design of this product is very funky and urban that will definitely enhance your personality. It is quite shiny as well, giving it a ravishing finishing touch. It is available in three colors: Black, Green and Purple. Question: Will this board be able to survive a long commute of 3 miles both ways, especially if you are not a good skater? Answer: Hello. Quest Skateboard can get up to a good speed and does not need to be pushed hard. However, a little practice can go a long way. Question: What is the width of the board? Answer: The board is about 9-10 inches, which is good for starters and cruising. Question: Does the designs underneath the Longboard scrape off easily? Answer: The designs are solid and varnished. Hence, they do not damage easily. 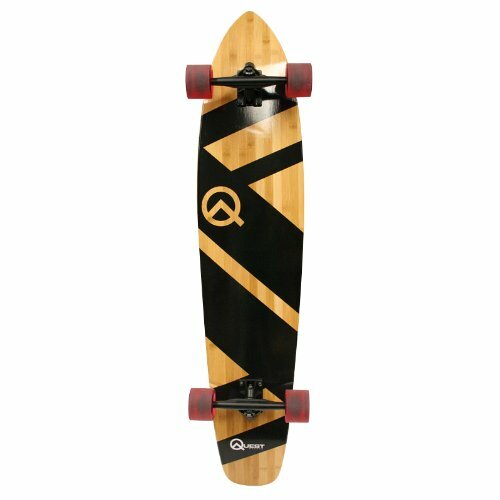 The Quest Skateboards Best 44″ Bamboo Super Cruiser Longboard Skateboard is a good choice for anyone, especially the starters. The whole product comes as a single piece with good wheels that are well lubed, wide aluminum trucks that resist rusting and great shiny graphics. Its wide board, kick tail and nose give users better performance, balance and make their journey enjoyable. Quest Skateboard is well-built because of the presence of strong maple hardwood, 7 super flex plywood, and bamboo. The greater dimensions of the board allow it to support heavier weights comfortably. It can also travel at a good speed and cover long distances. The board is also modifiable and adaptable if required. As for the heavyweight, Longboard is supposed to be wide and big which contributes to their weight. Altogether, it is a good deal for anyone who wants to start skateboarding afresh. It is suitable for teenagers and adults, but not for young children. That was all on our part. Hopefully, you will find the perfect match for you and make your summer skateboarding bliss. Happy Shopping!